In a crowded field of would-be Democratic presidents, Amy Klobuchar stands out for all the wrong reasons. The Minnesota senator hadn’t even launched her campaign before years-old rumors of her abusive behavior to staff gained shape and form in an initial HuffPost report. Klobuchar wrote “tardy slips” and left them on the desks of late-arriving aides, former staffers said. Others claimed she repeatedly demeaned their work as “the worst” she’d ever seen. From there, the accusations escalated: Klobuchar also threw a binder at a staffer and berated staff until they cried. 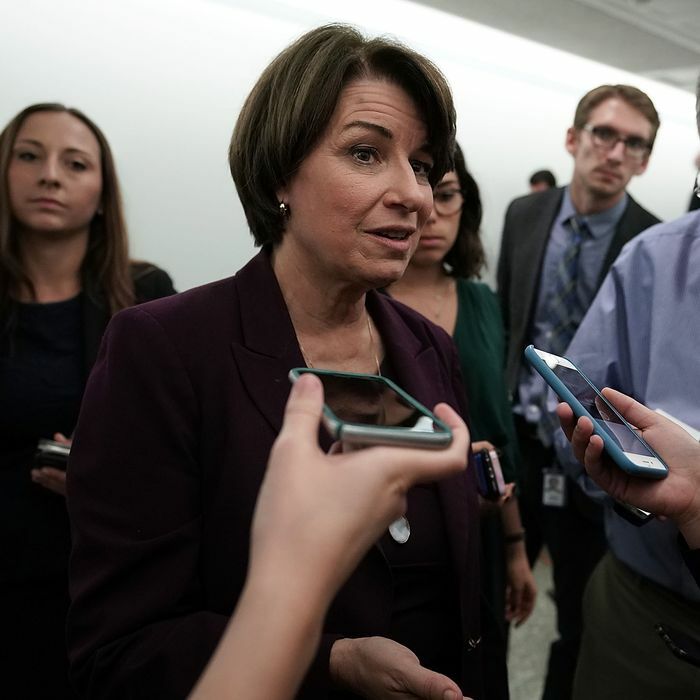 On Friday, the New York Times reported that Klobuchar and some top-ranking aides spoke to departing staffers’ would-be employers “to register her displeasure” with them. And, of course, there is the comb incident: Klobuchar, once offered a salad but no fork, ate the meal with a comb — and then made a staffer clean it. Palmieri and McGann are right in at least one sense. Abusive bosses aren’t a recent development, on Capitol Hill or anywhere else, and it is unusual for former staff to be so vocally critical of a presidential candidate’s workplace conduct. But while it may be true that male candidates have generally escaped similar scrutiny, Klobuchar’s gender doesn’t mitigate the actual substance of the complaints against her. The presence of women in power may challenge old gender stereotypes, but it doesn’t necessarily guarantee progress. A “Lean In” feminism that celebrates the mere fact of a woman’s power has little capacity to describe what, exactly, is so troubling about the Klobuchar story. A candidate who doesn’t respect her own staff invites valid skepticism that she’d safeguard American workers as president. Comb-gate makes a punchy headline, but it is actually one of the less disturbing reports to emerge from Klobuchar’s office. Employees say she also obstructed their job searches and kept a regressive family-leave policy on the books. According to the Times, Klobuchar required staff to remain with her office for three times as long as any leave they’d taken, and staff who left without doing so had to pay the office back for their leave. A spokesperson for Klobuchar said that no departing staffer had ever been forced to pay back leave, and that they intended to change the policy’s language. But if the fix is as simple as updating a handbook, the senator could have changed it long before her behavior made headlines. The leave policy may not be flashy, but it’s of a piece with the binder-throwing incident and with Comb-gate. Each strips workers of dignity, and reduces them to automatons who owe their employer extra time, effort, and tolerance. American workers can’t afford to hope that a President Klobuchar would keep her workplace attitudes separate from her policies. For the past two years, Donald Trump’s White House has assaulted workers on multiple fronts. Trump, who built a cult of celebrity partly on his reputation for being a ruthless boss, pushed tax cuts that profited wealthy households while rolling back workplace safety regulations for meat processing plants and mines, and weakening injury reporting requirements for employers. Child labor protections aren’t even safe from the Trump administration: The Department of Labor is trying to roll back rules that require adult supervision for teenage nursing-home employees who are operating heavy lifts. Trump’s daughter Ivanka, meanwhile, is touting paid family leave, but the only major Republican effort to get a family-leave bill through Congress would have allowed parents to withdraw their Social Security benefits early to offset the costs of their leave. Employers, in other words, would have no obligation to offer their workers paid leave. The Trump presidency’s hostility toward workers has produced some unintended side effects. Klobuchar, like any candidate who wants the Democratic Party’s nomination in 2020, will have to reckon with a resurgent labor movement: Since Trump took office, unions and advocacy groups have advanced workers’ rights at the ballot box and in state legislatures through a combination of savvy campaigning and direct action. In Missouri, for example, unions repelled right-to-work legislation via a public referendum. Five states have now passed bills that phase in a $15 minimum wage, in direct response to grassroots pressure. In New York City, similarly, city council leaders have introduced a bill that would make it more difficult for fast-food managers to fire workers without warning. And while the Supreme Court’s Janus v. AFSCME ruling did block public-sector unions from collecting dues from every worker in a bargaining unit, union membership has remained relatively steady in the ruling’s wake; workers weren’t waiting, breathlessly, to flee their unions without dues as a cattle prod to keep them in line. Teachers, meanwhile, continue to stage successful walkouts against charter schools and for higher wages and increased staffing in schools. Rising health-care costs and relatively stagnant wages can be crushing burdens for workers, but through organizing, they’ve created small pockets of relief — breathable air inside an avalanche. Klobuchar, a moderate Democrat, is already out of step with energized voters she can’t afford to alienate. Her alleged mistreatment of her own staff is germane, then, both to the viability of her candidacy and to her capacity to govern. As for her gender? There are other women running for president. And as far as we know, none of them have thrown a binder at an aide.